1 Nephi 1–2. Lehi learns in a vision that Jerusalem will be destroyed. He warns the people to repent, but they reject him and seek his life. 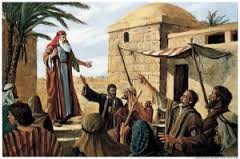 The Lord tells Lehi to take his family and leave Jerusalem. Lehi and his family depart into the wilderness. 1 Nephi 3–4. Nephi and his brothers return to Jerusalem to obtain the plates of brass from Laban. 1 Nephi 5. Nephi and his brothers bring the plates back to their family. These plates enable Lehi’s family to preserve for their descendants their language, their genealogy, and the teachings and commandments of God. 1 Nephi 7. Nephi and his brothers return to Jerusalem to persuade Ishmael and his family to join them in the wilderness. Additional reading: Mosiah 1:3–7; Alma 3:11–12. Click to view the video clip(s) below. We will be studying The Book of Mormon In Gospel Doctrine and you'll find us in the Cultural Hall. Please join us after Sacrament as quickly as possible. President Russell M. Nelson, President of the Quorum of the Twelve Apostles, will be the speaker at the first worldwide devotional for young adults scheduled for 2016. Addressing the topic of “Millennials in the Millennial Day,” President Nelson will discuss the importance of who millennials are and their unique opportunity to do good now. The broadcast on Sunday, January 10, 2016, at 8:00 p.m. eastern standard time (EST), will originate from the campus of Brigham Young University-Hawaii and will be broadcast to many areas of the world. All young single adults (ages 18–30) are invited to attend. Married institute and university students are also welcome to attend. The broadcast will be streamed live on LDS.org, YouTube, and other media.